Here is a wintery scene. 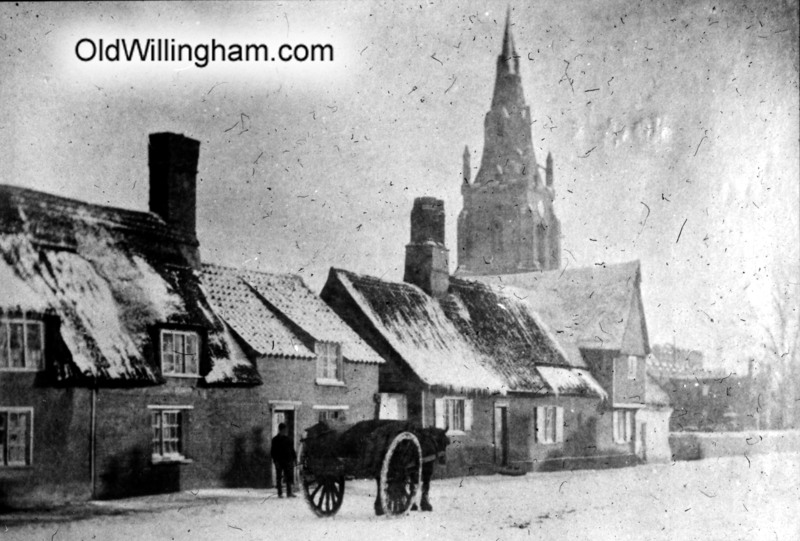 Apart from the church in the background you wouldn’t recognize it as Willingham as none of the buildings in the foreground remain today. This photo is taken from the corner of Church St. and High St. (Stock’s Corner,) probably in around 1897. The building on the corner of Church Lane was a bakery then as now but, as so often happened in those days of thatch, it burned down in the early 1900s taking the house next door with it. Although quaint, many of these old cottages were very small and lacking in amenities. The Edwardian houses that replaced them would have been considered luxurious by comparison.